We made a stop at Louis M. Martini Winery is St. Helena, Calif., back in 2007 and sampled some wines with Michael Martini straight out of the tanks, so we had tasted this cabernet sauvignon as an extremely young wine. 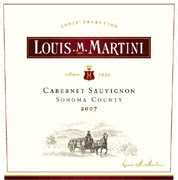 Sourced from Sonoma County vineyards, Louis Martini 2007 Cabernet Sauvignon is a rich red purple wine. Nice silky texture, good healthy level of fruit. Dark cherry and cassis dominate. Tannins are at a moderate level and the wine is very lively at this stage. A very good value -- we paid $30 for a bottle with dinner last night and saw it for under $12 today at a warehouse club -- and can be aged for another five years.